After opening on September 1, 2012, the L’Auberge Baton Rouge Casino Hotel is the newest casino in Louisiana. The property includes a 74,000-square-foot casino, nearly 1,500 slot machines, 50 table games, a poker room, a high-limit salon, a 12-story hotel with 205 guest rooms, a rooftop pool, four restaurants and a casino bar overlooking the Mississippi River. 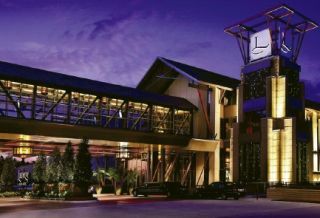 L’Auberge Baton Rouge is the fourth casino opened by Pinnacle Entertainment in Louisiana. As anyone who works at a casino can tell you, opening a new casino can be a gamble because of the competition from existing casinos that don’t want to give up their guests and patrons. To be successful, a new casino hotel needs to have the amenities and facilities to make it a destination resort. During the planning for L’Auberge Baton Rouge, Kim Ginn, vice president of marketing, wanted to make sure that the hotel would be known for being as innovative and guest-friendly as possible. Part of her responsibilities in reaching this goal included planning for digital signage; Ginn wanted something that was more eye-catching and dynamic than is typically seen in other casinos. Acting on a tip from Lynn Mayes, Pinnacle Entertainment's director of brand marketing, Ginn contacted Josh Hoffert, director of Alpha Video Creative, a digital signage content creation company known internationally for its work in the hospitality industry. The initial discussion revolved around designing digital slot toppers for the resort’s signature slot machines. To help establish the casino’s brand, Ginn wanted a unique bank of slot machines that capture some of Louisiana’s culture. After much discussion, the name Lagniappe Bonus Slots was selected. For those living outside of Louisiana, a lagniappe is a small gift given to a customer by a merchant at the time of purchase. The classic example is the 13th doughnut in a baker’s dozen or, as would be the case in Louisiana, the 13th beignet in a baker’s dozen. Alpha Video Creative designed a dynamic 90-second animation that conveyed the definition of Lagniappe by presenting guests with a visual image of what they could earn as they play the Louisiana Lagniappe slot machines. Once the content for the Lagniappe slot machine was approved, the planning team for the casino’s digital signage realized that the bar had been set high for the other digital signage on the property. And, in a casino and hotel, there is a lot of digital signage content that needs to be created. Working with Alpha Video Creative, the digital signage planning team developed a long list of digital signage content to be created before the grand opening. In the gaming area where the Lagniappe slots are located, animated videos or templates were also developed that provide a summary of the gaming offered, announce new games on the property, and promote progressive slots, the poker room and featured games. To create excitement in the gaming area, content was designed to announce big jackpot winners, the big table winners and the building up of progressive jackpots. Another important area for digital signage is related to the four restaurants: Bon Temp Buffet, Stadium Sports Bar & Grill, 18 Steak and PJ’s Cafe. A menu board template was designed for each of the restaurants and promotion animations were developed to attract guests to visit the restaurants. Digital signage content was also developed for the other retail operations on the property, including the Sundries Shop in the hotel. An increasingly important digital signage application for hotels and casinos is way-find kiosks. Alpha Video Creative designed the graphics and maps for the way-find kiosks and then turned the content over to Bally’s, which used CoolSign digital signage software to program the kiosks. To meet the goal of a guest-friendly hotel and casino, a great deal of content was developed, including a welcome video for the hotel lobby, a promotion video to promote grand opening events, and an hours-of-operations video and template to be used for promoting future events. Finally, content was developed to promote mychoice, the casino’s preferred members club. The club has five tier levels: Choice, Advantage, Preferred, Elite and The Owner’s Club. The promotional content explained the benefits for each of the five levels. Alpha Video Creative also developed open and closed animated signage that is used to inform guests if a station is open at the mychoice centers or at the Cashier Cages. Given the wide variety of content developed, it’s not surprising to learn that digital signage is installed throughout the property. But, it might be a surprise to learn that some of the most effective digital signs are located outside of the casino. According Tanner, the most impactful digital signs are located by the entrances to the hotel, in the elevators and in the Sky Bridge that connect the hotel to the casino.